For the sake of this list we’ve concentrated on events where comics are advertised as being a significant element of the convention. Omitted are the many literary and science fiction/fantasy conventions that do not actively/promote comics as an element of their event. But first, a note about Canadian regions and geography. Most of Canada’s 34+ Million population clusters in cities close to the US/Canada border like Vancouver, Calgary, Regina, Winnipeg, Toronto, Ottawa, Montreal, Quebec City and Halifax. 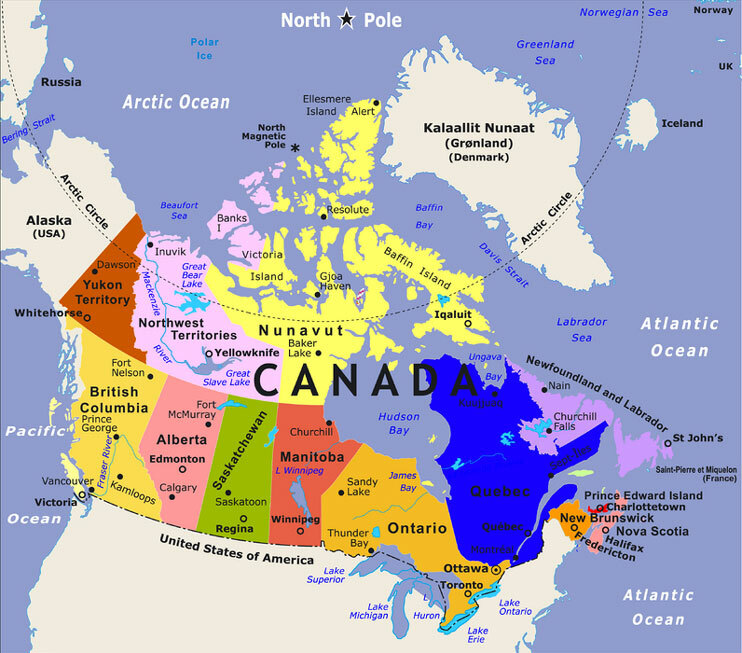 21 Million people live in Central Canada (Ontario and Quebec). 10 Million people live in the Western Provinces and the other 3 million in the Maritime Provinces. Under 100,000 people live in the northern territories. UNFORTUNATELY, due to an explosion of events across the country, we are unable to keep up with the checking of dates and verification of whether events are ongoing or cancelled. So we are taking down the list and the links until such time that the CCBCAA can maintain this page more accurately. At this time we are still unable to remain committed to updating this page on a regular basis. We thought there were a lot of related events back in July 2017 but it’s exploded even further in 2018 from coast to coast. Your best bet to find out what’s local for you is to google comic con (city or town name). Almost every major city or town has at least some kind of event, with large urban centres all having a national or large regional conventions such as: Victoria, Vancouver, Surrey, Calgary, Edmonton, Saskatoon, Regina, Winnipeg, Toronto, Niagara Falls, Ottawa, London, Windsor, Timmins, Sudbury, Quebec City, Montreal, Halifax, Dartmouth and more. Pop Culture Expos – these run the gamut from big national conventions to smaller regional shows. They have celebrities and appeal to a wide number of different fandoms under the same roof. Comic Arts Festivals – generally national level but some are smaller regional arts festivals that generally take place in places like libraries or public spaces, these do not have a large vendor presence and focus primarily on creators. Other genre shows with comics in the mix. Time for my annual update. 2017-18 continued to see an explosion of relevant events pop up on the calendar, and in some cases there are multiple events happening in the same town over the course of the same weekend…! Shows continue to be of the different types listed above. Popular formats are the (a) small local back issue buying comic book show types with little to no guests, and (b) the Library based Comic Art Festival type events. The latter is a popular format, and we urge you to look into events of note like the Prairie Comics Festival in Winnipeg (founded by editor/publisher Hope Nicholson) and the Mississauga Comic Expo MCX (founded by creator Jason Loo), and the Dartmouth Comic Arts Festival (established by Strange Adventures). I don’t know if I reported on this, but last year the VanCAF founder stepped back and that event was linked more officially with the Beguiling’s TCAF event in Toronto. On the big pop culture event scene, Informa’s Fan Expo HQ division made a few changes. As I think I reported elsewhere, the company purchased the Calgary and Edmonton Expos, and ran those events in 2018 using a mix of old staff and new, and the Calgary office has become Fan Expo HQ’s Western office and is now responsible for events in Calgary, Edmonton and takes Vancouver from the central Canada-based office in 2019. Fan Expo HQ announced in October that it would not be returning to Regina in 2019. More on that in the next paragraph…. Saskatoon was not part of the Calgary/Edmonton purchase, and the original promoters have continued on independently in fall 2018. In 2019, they will pick up where Fan Expo left off and launch a Sask Expo Regina on the same weekend and location where Fan Expo used to run their Regina event. C4 in Winnipeg, Hal*Con in Halifax, London Comic Con, Forest City Con, Windsor Comic Con are some of the other shows out there having various levels of success, I’m sure there are others. The Niagara Falls Comic Con and Hamilton Comic Con group continued with their events in those respective cities. The Montreal based group that assembles the Montreal Comic Con, Ottawa Comic Con and Quebec City Comic Con continue to grow their respective events. Richard Comely and Chapterhouse Comics tried their hand at putting on a comic con in October on Thanksgiving weekend with something called the Tri-City Comic Con. Who knows what will pop up where next, or who will try their hands at putting on a comic con somewhere else in 2019. It’s mainly a convention revolving around the world of mangas and its subproduct. Most of the convention is in french, but they also have english materials. Not really a comic con but Winnipeg also has Ai-Kon. It’s more Anime based but its still convention. PS, this is a very useful list — thank you so much for compiling it! Thanks for this list! I’ve been trying to find one of these for Vancouver! There’s another comic convention in Kelowna now, http://kelownafx.com/ it’ll be going a 3rd year this upcoming March (anounced on their facebook page, but not their webpage yet).